Born in 1859 in San Francisco, Theodore Wores was to become one of the earliest California born artists to achieve international respect. Receiving art lessons by age 12, he was one of the first students enrolled in the newly formed San Francisco Art Association's School of Design in 1874. Later in life, after the 1906 earthquake, he was elected Dean of the re-organized San Francisco Art Institute (formerly the California School of Design) following the directorship of Arthur Mathews. Though Wores' early training was in the academic style reflecting his training at the Royal Academy in Munich, he later turned towards a personal approach which combined detailed representational brushwork with the palette of impressionism. Wores remained an artist of traditional values, and later in life, as was his colleague Percy Gray, he was a conservative in a modernist era. He was an active and vocal member of the Society for Sanity in Art. Upon moving permanently to Saratoga from San Francisco in 1929, he expressed his need to "breathe the wholesome mountain air unpolluted by poisonous germs of diseased art." In the early teens of the twentieth century Wores became captivated by the beauty of the wildflowers and sand dunes from Monterey to San Francisco. Just as his contemporaries, John Gamble, Percy Gray, and Granville Redmond, much of Wores' acclaim from this period was derived from this subject matter. 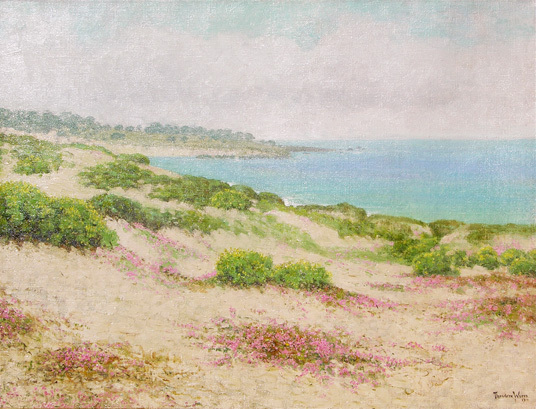 "Sand Dunes With Blue Lupine and Wildflowers", painted in 1916, is a significant and sizeable canvas representing the best of Wores' abilities as a California coastal impressionist.